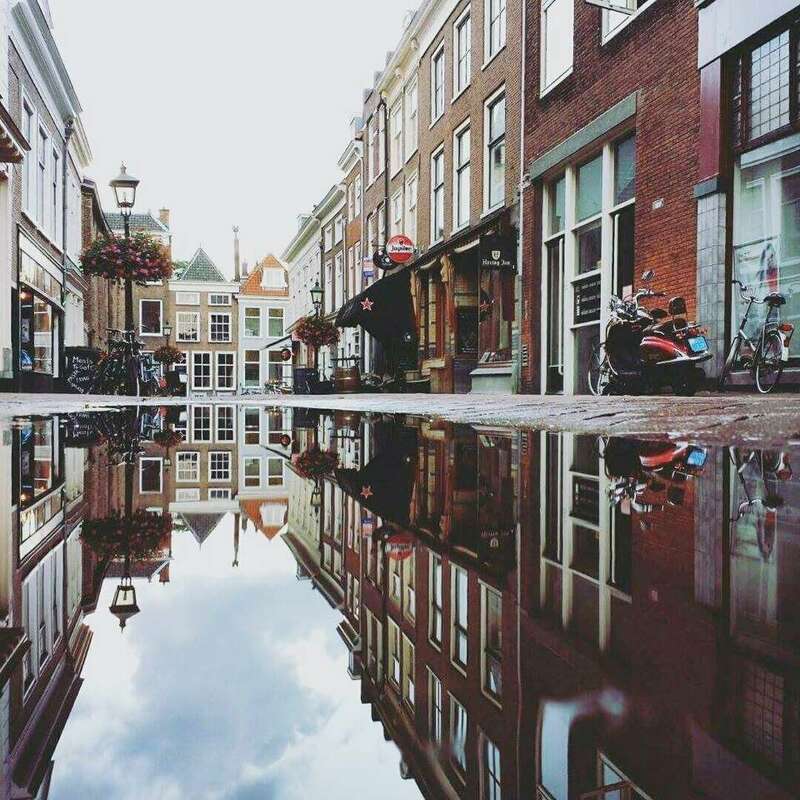 Delft, just an hour by train from Amsterdam, is a city that positively exudes old Dutch charm. Synonymous with the "Delft Blue" porcelain that's beloved worldwide, Delft also boasts painter Jan Vermeer as its native son, as well as some of The Netherlands' most iconic places: from the spacious square in the shadow of the Nieuwe Kerk (New Church), to the five majestic spires of the Oude Kerk (Old Church). By train - Two direct trains per hour connect Amsterdam and Delft; the trip takes approximately one hour. See the Dutch Railways website for schedule and fare information. Visit Delft's quintessential attractions, the Nieuwe Kerk and Oude Kerk, two splendorous churches that house the remains of some of the Netherlands' most celebrated citizens. The Nieuwe Kerk, on the northern perimeter of Delft's lovely main square (simply called "de Markt," or market), is a 15th-century Gothic landmark. It serves as the burial place for members of the Dutch Royal House, not least of all national hero William the Silent. The nearby Oude Kerk, which predates the Nieuwe Kerk by two centuries, is the final home of Jan Vermeer, the Dutch Baroque painter and one of the most celebrated 17th-century masters. Witness the production of Delft Blue porcelain at Royal Delft, the oldest extant "Delftware" factory. Dutch potters took on the blue and white motifs of Chinese porcelain in the early 17th century and soon personalized them with native Dutch icons like tulips and windmills. See precious vases, plates, and tiles at the open factory, and learn about their laborious manufacture. Discover your inner history buff at Museum Het Prinsenhof, which chronicles the story of the Dutch Republic. Housed in a converted 15th-century convent, the tranquil courtyard takes visitors' breaths with manicured shrubbery that winds around a monumental statue of William the Silent; inside, visitors can learn about this "Father of the Fatherland" and the Dutch Republic's 17th-century heyday. When the distiller Lambert van Meerten went bankrupt in the early 20th century, his friends took on his vision of a public home for his collection. These fine and decorative arts are still on public view at the Museum Lambert van Meerten, from period furniture to priceless Dutch porcelain and tiles. Het Wapen van Delft (Markt 34) - This restaurant's claim to fame is one day in 1997 when President Bill Clinton and First Lady Hillary Clinton stopped in for a meal of poffertjes, the Dutch version of silver-dollar pancakes. With a scenic location on the market square and a classic menu of traditional Dutch pancakes, Het Wapen van Delft is a surefire choice to take in Dutch culture and cuisine all in one. De Zeven Zonden - "The Seven Sins" offers a small but uniquely eclectic menu with a couple of meat-free choices, and at affordable prices, too -- which makes the Seven Sins not sound so sinful after all. De Ruif - This student favorite serves up real comfort food in a casual atmosphere; their comically named dishes fuse Dutch, French and Italian cuisine for a sophisticated, but an unpretentious pan-European result. Delft Chamber Music Festival - Classical music lovers turn out in droves for this annual festival, a several-week summer event that attracts accomplished international musicians to the traditional venue, Museum het Prinsenhof. Delft Ceramica - This international ceramics exposition takes over the market square in July, with around 60 stalls from both new and established artists. Collectors rub elbows in the hunt for new acquisitions, while fans wait to hear who is awarded the annual Delft Ceramica Award. This Lovely North Sea Beach is a Short Ride From Amsterdam.